00:30:00 Makes 4 servings, 1/4 recipe (327 g) each. Makes 4 servings, 1/4 recipe (327 g) each. A flavourful and balanced dinner that is sure to be a hit with the entire family. Cook rice as directed on package, using 1 cup broth and 1/2 cup water. Meanwhile, mix cracker crumbs and Parmesan on plate. Rinse chicken with cold water; gently shake off excess water. Dip chicken in crumb mixture, turning to evenly coat both sides of each breast. Heat oil in large nonstick skillet on medium heat. Add chicken; cook 5 to 6 min. on each side or until golden brown on both sides and done (170ºF). Transfer to serving plate; cover to keep warm. Add remaining broth, water and cream cheese product to skillet; cook on medium heat until mixture just comes to boil, stirring constantly. Simmer 3 min. or until sauce is thickened, stirring frequently. Spoon over chicken. 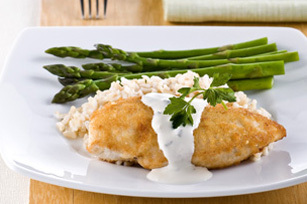 Serve with rice and asparagus. Substitute Philadelphia Light Cream Cheese Product and 1 Tbsp. chopped fresh chives for the Philadelphia Herb & Garlic Light Cream Cheese Product. Substitute 2 cups frozen green beans, cooked and drained, for the asparagus. Asparagus spears snap off naturally where they are tough. Simply bend the spear near the bottom end and it will break off at the right point. Or, remove an inch or so of the woody portion off the bottom of the stalks with a sharp knife. Asparagus should be green with firm stalks and closed, compact tips. Stalks can be thin or thick; it is a matter of personal preference. To store, stand fresh asparagus spears upright in a container filled with about 1 inch of water. Cover loosely with a plastic bag and refrigerate. Or, store in refrigerator with a damp paper towel wrapped around base of stalks and cover loosely with a plastic bag. Asparagus is best when cooked the day it is purchased, but will keep up to 3 or 4 days. Wash just before using. Good news! This great-tasting oh-so-easy dinner contains foods from three different food groups, helping you to eat a variety of foods. Serving Size Makes 4 servings, 1/4 recipe (327 g) each.